It’s no secret that Ween is one of my favorite bands…If you’ve ever listened to my radio show, you’ll notice that I very casually slip in a Ween song whenever I can get away with it…(reason #182732987 why this station rocks)…So you can imagine my excitement when the Dean Ween Group & the Meat Puppets announced they’ll be spending Halloween in Missoula playing the best venue in town, the Wilma..better yet, The Trail 1033 was able to have the opportunity to be the Presenting Station! So with that said, I couldn’t let the opportunity to saturate the airwaves with Ween slip by….And so ladies and gentlemen, I present to you…. 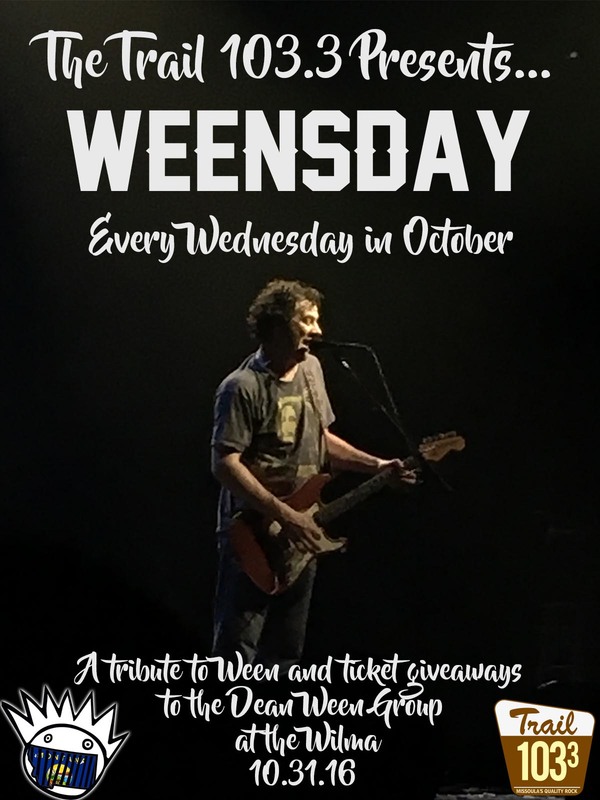 Every Wednesday during the month of October during the noon hour, I will be featuring some of my favorite songs from Ween (on both CD & Vinyl) and will accompany the feature with a ticket giveaway to the Halloween show in Missoula. Wanna make a request? Shoot me an e-mail here! Thanks for listening– see ya at the show!